No.FPC.4/2018/138: In exercise of the power conferred by the proviso to Article 309 of the Constitution of India, the Governor of Assam is pleased to order that following further entry shall be made in Para 10(i) Hill / Remote Area Allowance (Page 292) after the existing entry of the Assam Services (ROP) Rules, 2017 published in the extraordinary issue of the Assam Gazette dated 17th March, 2017 under the Notification No.FPC.1/2017/Pt/2, dated 17-03¬2017. The Hill Area Allowance will be with immediate effect. “The employees working in the Assam House, Shillong at the following rates” Grade Rate Senior Grade/ Grade-I Rs. 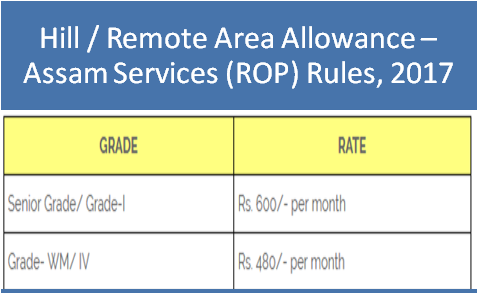 600/- per month Grade- WM/ IV Rs. 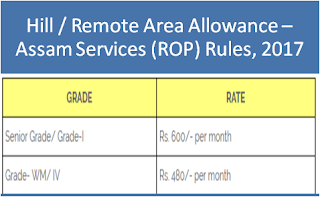 480/- per month The Hill Area Allowance will be with immediate effect.